Kootenai Electric Cooperative’s Fighting Creek Landfill Gas-to-Energy project will hold an open house at the facility so the public can take tours on May 30. The tours will run from 10 a.m. to 3 p.m. at the facility site at 22089 S. Highway 95, 16 miles south of Coeur d’Alene. Visit www.kec.com or call (208) 765-1200 for more information. 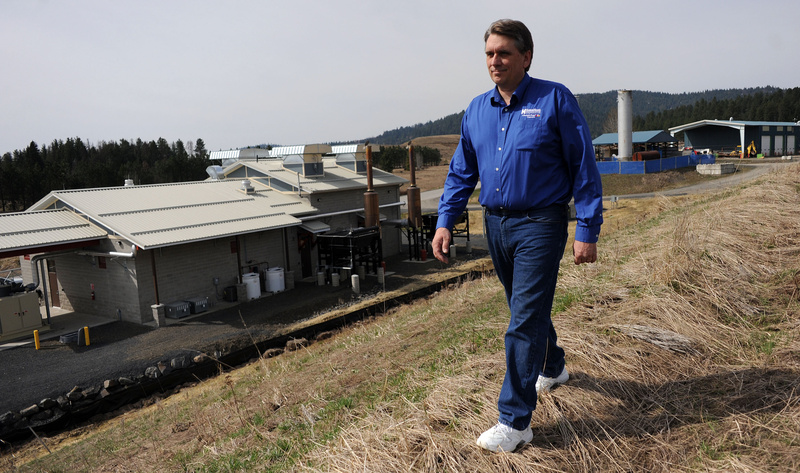 Methane gas that long has formed deep within the rotting garbage at Kootenai County’s Fighting Creek Landfill is going to a new use these days: It’s generating enough electricity to power 1,800 homes. The county and the nonprofit Kootenai Electric Cooperative flipped the switch on their joint venture last month, launching a new clean, renewable, local power source that has officials beaming with pride. But in the larger world of energy politics, the project has landed Kootenai Electric in the middle of a big-bucks fight between Idaho’s largest utilities and small renewable power generators. At issue are renewable energy credits that can be sold on the open market to utilities operating in states like Washington that require power companies to derive growing percentages of their power from renewable sources. While Kootenai Electric will sell the Fighting Creek project’s electricity to other utilities in coming years, it argues that it should keep the energy credits that go along with it, which make up a key piece of the new plant’s long-term financial plan. But Idaho’s three largest utilities – Avista Corp., Idaho Power and Rocky Mountain Power – introduced legislation this year declaring that when a utility buys power from a renewable generator, it gets the credits too. The bill didn’t pass, but it set off a fiery debate that’s now playing out in a pending case at the Idaho Public Utilities Commission, which has approved some contracts in recent years in which utilities and generators split the credits. Kootenai Electric isn’t alone in counting on the valuable credits, commonly known as “green tags.” Among other generators across the state that rely on the credits is Clearwater Paper, which runs a 50-megawatt woody biomass cogeneration plant at its Lewiston paper mill. The credits add between $1 million and $4 million a year to the company’s bottom line, depending on the market. “We firmly believe that whoever is the one that invests in building and maintaining facilities for green power should own the RECs,” Clearwater spokesman Matt Van Vleet said. Avista had been in long negotiations with Kootenai Electric on a power purchase agreement from the new Fighting Creek plant, but the two sides couldn’t agree on the renewable credit issue. The cooperative already has given half the credits from the plant to the county, under its contract, and is counting on the other half for its own money-making purposes. PURPA is the Public Utility Regulatory Policies Act of 1978, which requires investor-owned electric utilities to buy energy from small-power producers at what’s called their “avoided cost” rate, which is calculated as the amount the utility would otherwise spend to produce the power itself or buy it elsewhere. Colwell said the rate is favorable, and higher than what Kootenai Electric already is paying to buy power from the Bonneville Power Administration to serve its 22,000 customers in and around Kootenai County. “That causes our customers to subsidize Kootenai’s customers,” he said. Erika Neff, communications coordinator for Kootenai Electric, said the cooperative hopes to use the landfill gas energy for its own customers eventually, but for now, it’s locked into long-term contracts with the BPA that run through 2019. “We wanted to do this Fighting Creek landfill gas project, it was a good opportunity. It’s going to benefit our members regardless, and we’ll see after we’re done with our Bonneville contract how we can incorporate it into our mix,” she said. Kootenai Electric is a member-owned cooperative first formed in 1938 to bring electricity to Kootenai County’s rural areas. It has since expanded into Hayden and Post Falls and now has about 22,000 member accounts. With the green tag issue unresolved, Kootenai Electric and Avista reached a short-term agreement under which Avista will purchase the Fighting Creek power at market rates, and Kootenai Electric can cancel the contract with 30 days’ notice when it makes other arrangements. Meanwhile, the cooperative is trying to sign a deal to send the landfill power to Oregon – where state law says the generator gets to keep the renewable energy credits. “We’re working on a contract with Idaho Power in Oregon, so that’s kind of where we are right now,” Neff said. Idaho Power, which operates in Oregon but has 95 percent of its customers in Idaho, is objecting to the move and asking the Idaho Public Utilities Commission to weigh in and call it an Idaho transaction; a ruling is expected in the coming weeks. Gene Fadness, PUC spokesman, said the commission wouldn’t have minded some legislative guidance on the credit issue , but it didn’t support the utilities’ bill. “We’ve been able to work the issue out individually in previous cases,” he said. At Fighting Creek, Saterfiel is hesitant to wade into the debate. “I’m not a power guy, I’m a garbage guy,” he said. But he sees great potential in the landfill-gas plant for the county – including generating revenue both from gas sales and from environmental credits that could keep down or even reduce the annual $93 solid waste fee that county property owners now pay on their property tax bills.